The boys, Karen had explained back in Terrace, would amuse themselves on the family cycle expedition along Vancouver Island by seeing what they could spot discarded on the shoulder or in the ditches beside the highway. Lots of nails. I wondered if they’d also noticed the shredded tyres, sharp wire strands that had cost me two punctures back in Australia. I’d my own games to play. Waving to trucks my favourite. The tooting game. First wave, arm outstretched, as the lorry approaches, a good few hundred yards behind. Let him know I’ve seen him in my mirror. Then, as he passes, another flourish of the hand, proportionate to the space I’m given. A thank-you. Waiting to see if an uplifting honk or two on the horn will follow. Late in the day from Ken Roberts on Vimeo. Ken stops for a short break towards the end of a cold, wet and miserable day. 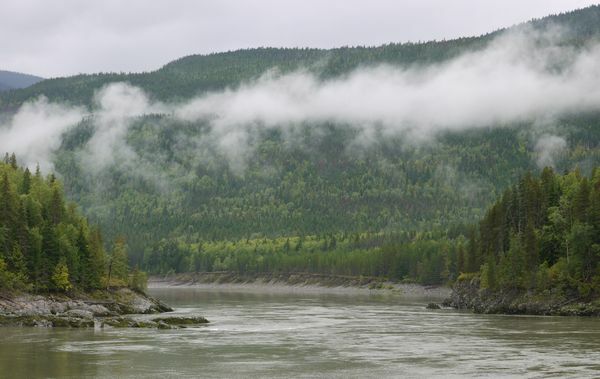 Still following the Skeena river, as he’s done for over a hundred miles. The Skeena river wasn’t one to disappoint. For, continuing my journey along its banks inland beyond the town of Terrace towards the small settlement of Kitwanga, it was truly the river of mists. Cold, wet and miserable day. Just a decent, nourishing packed lunch and a flask of hot coffee to keep morale up. Both carefully eked out to sustain myself over the six five miles or so along the highway. There’d been interludes. A few walkers on the far bank. Wondering how they had crossed, for I’d not seen a bridge for ages. A train. Much shorter than the earlier ones. A large bird on the far bank. A bald eagle perhaps. But otherwise, pushing along the highway, trying my best to settle into a rhythm as the traffic flew past, fine spray coating my glasses. Whilst my general direct was east towards the large regional centre of Prince George, I’d mountains to negotiate, necessitating a day running north east, before heading south east for a few days. 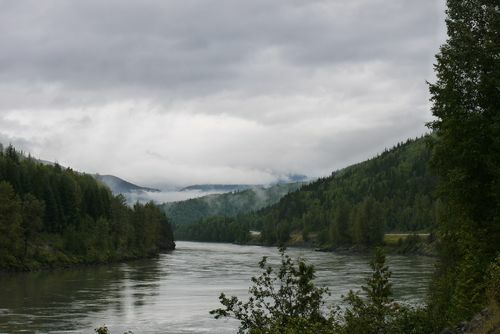 Wispy clouds about the Skeena river, between Terrace and Kitwanga in Canada’s British Columbia Province. Early evening. Not so jovial from Ken Roberts on Vimeo. It’s not always Swallows and Amazons on the road, explains Ken. A particularly wet, cold and miserable day. Just a decent packed lunch and a flask of coffee, carefully eked out, to bolster ebbing morale. Back in Terrace from Ken Roberts on Vimeo. After an overnight stop with a family "off the beaten track". Ken returns to the outskirts of Terrace, in Canada’s British Columbia, to rejoin the highway east. Start of a damp day. Family outing from Ken Roberts on Vimeo. Travis and Karen, Ken’s hosts in Terrace, British Columbia, recount tales of a family outing to Vancouver Island. On bicycles. With three – not five as Ken mistakenly mentions in the clip – young and energetic boys.